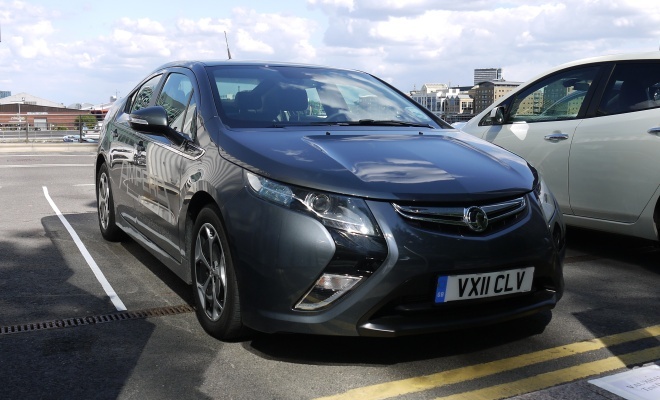 We engage mountain mode in our Vauxhall Ampera as we exit the roundabout, even though the only peaks in sight are the steel and glass cathedrals of London’s Docklands. I want to learn what the engine sounds and feels like and, left to its own devices, it would remain dormant for another seven miles or so, according to the dashboard display. My test drive isn’t going to last that long, so my Vauxhall minder obliges by prodding the button to bring on uphill mode. The notion is that you switch modes before you reach the slopes, so the battery is charged and ready to assist when you arrive at the steep bits. It can also preserve your plug-in power when you know there’s urban motoring at the far end of a high-speed stint. And the answer is that the engine sounds and feels perfectly unremarkable, as you might imagine given that it’s a conventional 1.4-litre petrol with only minor modifications. If it does sound unusual it’s only that it keeps thrumming away at medium revs, steadily charging the battery, irrespective of road speed. Apparently it will sweep up to higher revs and greater generation as speed builds beyond the urban limits of my test route. I’m itching to go faster and further, but it won’t happen today. This car is a pre-production, left-hand drive unit, on show at London’s Motor Expo. 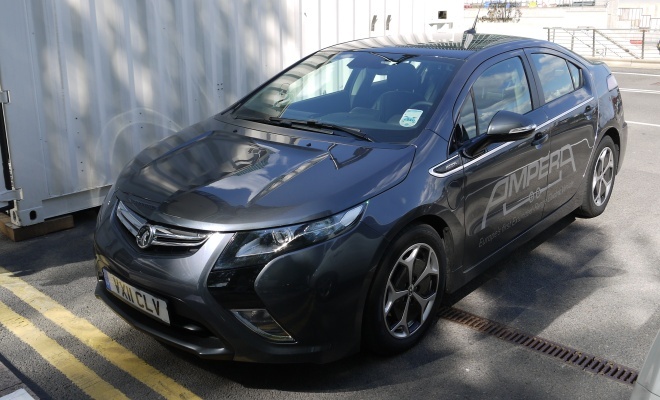 The finished Ampera is due to go on sale in the UK in spring 2012, and my requests for a press test car have been gently rebuffed until nearer the time. I suspect GreenMotor.co.uk ranks in the same region as FromPoppy.com in Vauxhall’s publicity priority list. Inside, the car feels cosy and conventional. You sit surprisingly low, but it’s easy to get comfortably set up, with plenty of wheel and seat adjustment – all via the traditional lever-plus-pull-and-shove method, of course. No electric motors here. 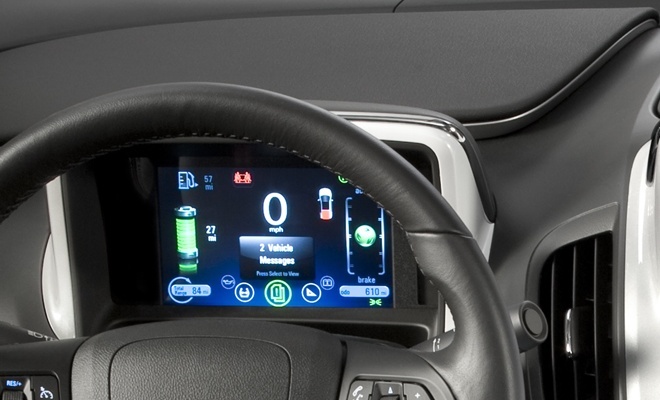 The main instrument panel is an oblong digital screen set behind the wheel. It shows big white-on-black numerals for speed in the centre, battery and fuel gauges to the left and a demand meter to the right. The gauges are detailed 3D representations of emptying tanks or depleting cells, one above the other, one small and one large. They swap places depending on whether the engine is running or not and each is supplemented by its own estimate of range. The demand meter, meanwhile, is a green sphere bedecked with leaves that rolls upwards, contracts, loses its leaves and yellows as you accelerate hard, or rolls downwards in similar fashion if you brake sharply enough to overwhelm the energy regeneration. Another screen at the top of the centre stack can summon up various views including one that depicts animated flows of energy between wheels, batteries and engine in distractingly rendered 3D. If I’m honest, I don’t like the fancy imagery. It’s all very Apple in its look and feel, but while an iPad generally enjoys your full attention, a car’s instrument panel does a very different job. It ought to strive to inform at a glance, and a little more visual simplicity would be welcome. But it is all digital, so maybe there’ll be an app for that. The rest of the centre stack is glossy grey plastic, forming an arch over the gear selector, which reminds me vaguely of a cordless phone. You pull back from park into reverse, neutral and forward gear, having first started the car with a silent prod of the blue-lit power button. 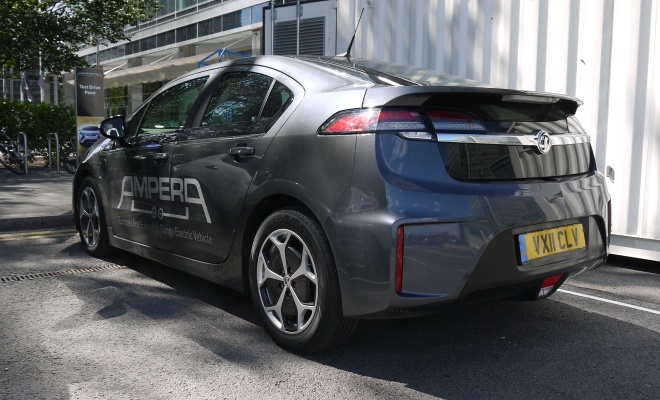 Release the electronic handbrake and you can glide off in typical electric car quiet. There’s an equality to the controls: light steering, smoothly responsive throttle and seamless brakes. There’s no hint of the incredibly complicated paddling going on beneath the swan-like surface as I glide from junction to roundabout to traffic light. Engine, generator, brakes, motor, battery, inverter and modulator all blend together to hide the joins. It all feels very pleasant, even if there’s not much luxury on offer for your £28,995 (after the government’s five grand contribution). I’ll reserve judgement until I’ve tried it on rougher roads and at higher speeds, but for now my impressions are pretty positive. Roll on spring 2012.